The conference will take place at the University of Belgrade, Faculty of Organizational Sciences (http://www.fon.bg.ac.rs), in Belgrade (Tourist Organization of Belgrade), Serbia. 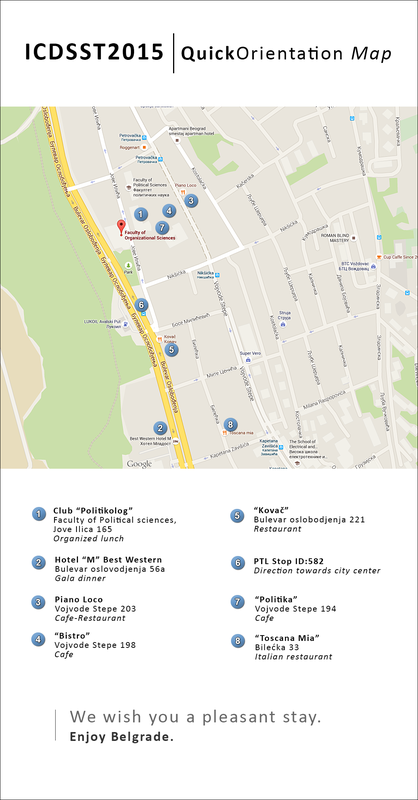 How to get to Faculty of Organizational Sciences from Slavija Square? How to get to Hotel M from Slavija Square? From Slavia Square to Hotel M buses 33, 47 , 48 , 9A*, 59** , 78** are available (station Mosorska, ID 859). *Please note that sometimes buses operating on the line 9A are labeled just with number 9 (without additional letter ‘A’). Please, feel free to use them, as it is actually the same line. **Please note that lines 59 and 78 are currently diverted to the Liberation boulevard (Bulevar oslobođenja) due to ongoing reconstruction of the nearby roundabout Autokomanda. However, their standard routes (as shown in the maps) are not a good choice for getting to the venue, but for the present, they could help you avoid crowded buses during the rush hour. In case of any change, the information will be updated in a timely manner. Therefore, please, check this page regularly to obtain the latest information. How to get to Faculty of Organizational Sciences or Hotel M from Zeleni Venac? First, walk to station Terazije (ID: 192). Then, use PTL 19, 21, 22 (trolleys) or 31 (bus) from station Terazije to Slavia Square (ID: 199 – trolleys, ID: 1691 – bus). Then, use transportation to Faculty of Organizational Sciences or Hotel M described above. Help link is provided here. For the use of taxi services from Belgrade Airport Nikola Tesla to any destination in Belgrade area and further, please contact the city service TAXI INFO desk, located in the baggage reclaim area. Regular taxi fares and other information regarding taxi service in Belgrade are available on this link. Additionally, flat rate for taxi fares form Airport Nikola Tesla are provided here. Faculty of Organizational Sciences and Hotel M Best Western are located in Voždovac area. If you prefer to pay the service with the credit card, Naxis Taxi offers this possibility. They accept following credit cards.